The hilt, the crested knuckle guard, double ball grips and double-edged blade (both sides) are entirely covered with silver inlay of the most exquisite fineness in scrolling picca mala (jasmine creeper) form with the creepers being arranged in such a way as to form a stylised kirtimukha mask at the top of the blade, and on the top of the knuckle grad they form a pair of adorsed yalis. The nuts in the sides of the hilt used to secure the double grips have been inlaid with both silver and gold. 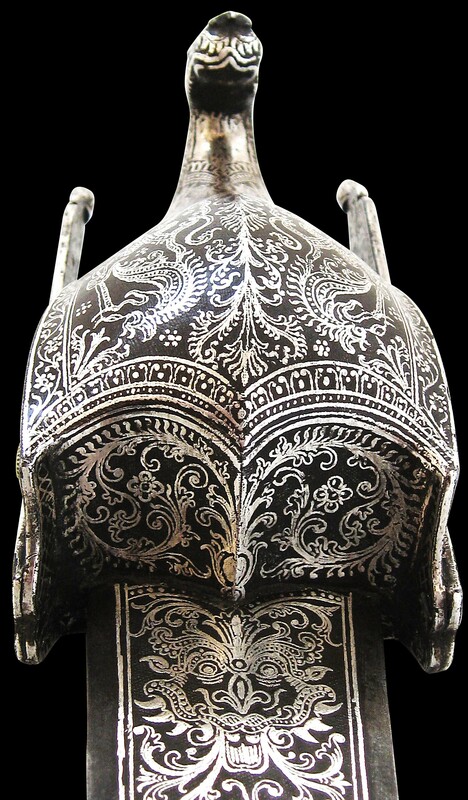 The silver and gold damascening is in keeping with the goldwork shown on a Tanjore-style katar in New York’s Metropolitan Museum and illustrated in Elgood (2004, p. 149), and the silver inlaid picca mala scroll-work on the knuckle guard of a Srirangan katar that was offered at Bonhams, in its ‘The Jacques Desenfans Collection’ April 10, 2008, as lot 275.